If your website isn’t a resource to provide help to potential customers then it won’t bring new leads. Helpful blog posts are a way you can deliver content that answers your industry’s most important questions. Every blog post should answer a question your target audience is asking. If you have content that answers people’s questions then it’s a good tool to open conversations and help them. You have to be careful when creating good blog content for your business though. You can’t write too broad of topics because you’ll lose people’s trust by not answering their questions fully. It all comes down to answering questions, answering them well, and staying focused. The most important thing to avoid when trying to create helpful blog posts is to never get too broad. The temptation is hard to resist wanting to go into several different topics in one helpful blog post. It soon starts to become unhelpful when the tangents and information grows too large and too broad. Blog posts start to lose their cohesiveness and interest. I could try to cover a broad blog post on online presence. That wouldn’t be very helpful though. It’s best if I can break down the topic further so I cover one helpful topic. Instead of an article about online presence, I might write a more specific post about how to set up your Facebook business page to expand your online presence. It’s hard to draw the line between what’s too broad and what’s specific enough. It really comes down to your best judgment and knowing if you can sufficiently cover the topic in one helpful blog post. The easiest way to know how if you’re too broad is to think about how many problems you’re trying to solve in each blog post. Are you trying to solve too many? If you’re trying to solve more than 1 then it’s likely your topic is too broad. Stick to answering one major question and sticking to one topic in each blog post. Of course, that one question shouldn’t be one of the many questions that could be asked when covering a certain topic. Go in-depth answering questions people have when solving their problem. How do you get started with Google Business Posts? Why would I need to post to Google Business? What should I include in my post? The overall topic is Google Business Posts and it answers all the questions someone may have about it. There are many specific questions and answers that help cover the narrow topic. Hopefully, it’s a bit clearer on why you shouldn’t stay too broad. Now it’s time to look a bit more at going deep which I’ve already alluded to. Helpful blog content answers the questions someone might have about any given topic. That doesn’t mean it covers everything closely related to the topic though. Going deep means covering one topic and then breaking that down into the answers people may have on that topic. I covered that a bit in the last section with some of the questions someone might want to know about Google Business Posts. The simple solution is to go deep on the topic at hand (in my example Google Business Post) and then link to helpful blog posts that expand on the topic. The internet is a place of hyperlinks which is the perfect way to go deep while also providing supplementary information that’s related in other helpful blog posts. An example of this is the ultimate guide to setting up a successful Google Business Profile. There’s a lot of information in the article but specific topics such as the one on Google Business Posts bulks up the article too much. The solution to a topic that’s related but takes away from the primary topic of a blog post? Link to another blog post that you have written (or when you do write about it) which covers the additional topic. Your goal, in the end, is to make experts out of your readers with the topic you’re covering. That doesn’t mean they’re anywhere near as good as you because you’ve been DOING it a lot longer. Doing something is infinitely more important than reading an in-depth blog post about it. No matter how in-depth a post is the expertise comes from doing. Most people will find your blog post looking for a specific answer to their specific problem. That means most will skim your article looking for pertinent information to them. That’s ok though, you want to provide the full story on the given topic which provides more answers than one single person will look for. Everyone’s unique though. Regardless of whether you DO make people an expert or not, a deep blog post should make someone an expert if they read the full topic and linked content. How deep you need to go on any given topic will change dramatically from topic to topic. Before you can answer any question, you need to know the questions your target audience is asking. Meaningful organic website traffic comes primarily from people searching for help related to your industry. If you’re a pest control company then people who are having pest problems are on Google searching. They’re either searching for a pest control company right off the bat or they’re going to try it themselves first. Being where people are looking for a pest company is an entirely different topic because you have to be seen and have good reviews. I won’t go anymore into that here. One of your focuses for getting new leads in the door (by increasing your website rank and authority) is by helping people. If someone (like a DIYer like me) has an ant problem and continues to have one after using ant spray then they’re going to be looking for more help. I go to Google first for help with any problem to see if I can solve it first. I may even try a few more things if I find them on Google. Sometimes they work out and other times they don’t. If I find something helpful to try online then I’m going to already have some trust in the company who provided it to me. Not all solutions will work, though, which should be made plainly clear. Perhaps I downloaded a document that helps me solve my ant problem and I provided an email address to get it. Now I’m the perfect candidate for sending a discount for my first service. The value that discount would bring goes beyond the initial coupon value. You just brought in a potential lifelong customer. Hopefully, you see how the whole process can work out for you. Now you need to know what questions people are asking and provide answers to them. There are luckily a lot of resources for finding the questions people are asking in your industry. If you know your services or products well (I hope you do!) then you can easily find stuff people are searching for around it. There are places that are easy to find (and answer) the questions people actually ask. Quora is one of the best places online for this. 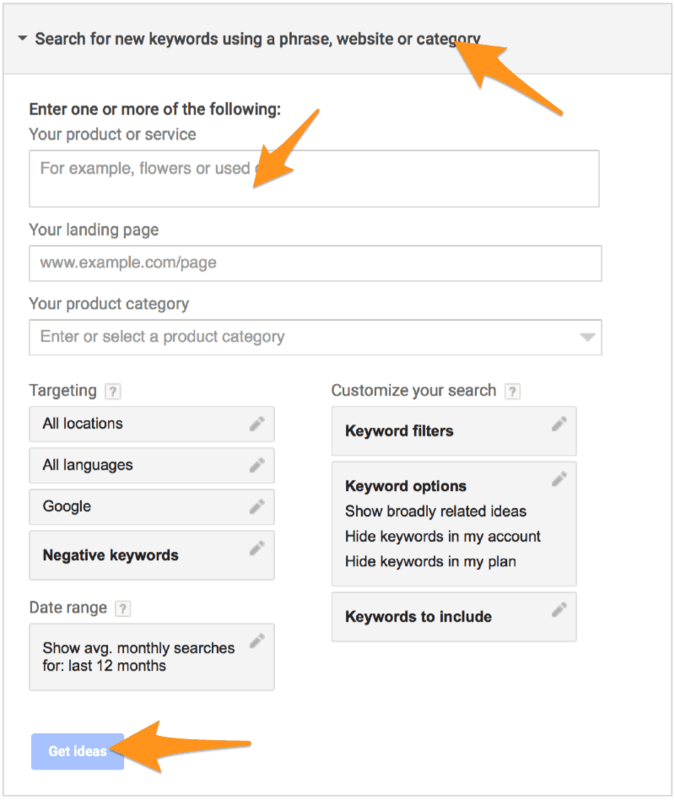 You can search a few keywords and find all questions people ask that match those keywords. Maybe you want to stick with some broader questions people are asking in your industry though. Some people are asking Google their questions in hopes of finding answers that are already written. Quora makes you ask then wait for an answer, if a question has been answered then they’ll find it immediately on Google. An amazing website I recently discovered will put together a list of questions around your keywords that people are asking Google. Answer The Public is the perfect place to compile an awesome list of questions you can answer in your helpful blog posts. 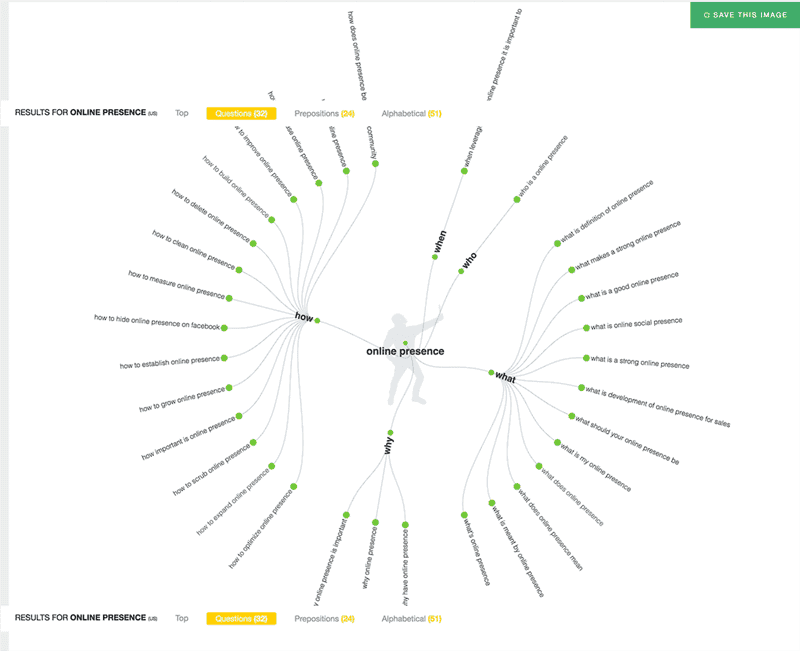 This is just one of the visualizations with the data people ask from the keywords online presence. You can even export the data it gives you into a comma separated value (CSV) file that you can then save for later. There are other places you can get this data though. Google provides everyone (for free) the AdWords planner even if you don’t pay for AdWords. You can easily look up who is searching what and even get the questions people are asking. Head over to the Ads keyword planner and do a keyword search to find tons of terms people are using in your industry. The last place you can look for the questions people are asking is social media. It’s not just a great place to help people out and make connections, it’s also a good place to learn. The conversations you have on social media are almost always rooted in a problem. A little bit of digging for information in a few of these places and you should have a long list of questions people are asking. Providing the answers to these is the perfect route to helpful blog posts. Your website needs to be equipped for the helpful blog posts that answer potential customers questions. That means you have a well-optimized website that also has a blog that is correctly optimized. A well-optimized blog and blog posts come down to the title and description but many other factors also hinge on the success of your content. Every page needs a goal and that means blog posts too. Every business needs a good website and a useful blog is also a necessity for businesses. As you expand your helpful blog content, the traffic to your website will also expand. Not only that but it will be useful traffic with qualified leads rather than just untargeted visitors. Have you found any interesting ways to write helpful blog posts and research what you need for them?